We’ve all seen email subject line horror — “Fw: Fw: Fw: Re: Re: Re: Re: Re: Requesting Information.” In fact, you might even have been guilty of it yourself. In our ongoing quest to make email more productive, we’re here to help. When it comes to email subject lines, there’s a better way. Here’s the SaneBox Scoop on writing much better email subject lines. Business emails to colleagues, partners, suppliers, employees, managers, or anyone else you interact with in business. The aim of these subject lines is for the recipient to act on the contents of the email and give you the action or information you need. Marketing emails to customers. The aim of these subject lines is to get the customer to open your email, read it, and act on it. We’ll cover each of these below. Everyone gets too much email — if you don’t, we’d love to meet you! But, when it comes to reading, reviewing, and most importantly, replying to email, you need to make that as easy as possible. That starts with the subject line — when people glance at their inbox, they are more likely to act on an email if the subject line entices them to do so. Feedback needed on an attached project plan. Please complete enclosed feedback form. Feedback needed on attached project plan to upgrade data center C.
Please complete enclosed feedback form for your employee evaluation. For information only – Review of existing marketing strategy. Request for information – Expense reports for a sales team. Feedback needed by April 10 on attached project plan to upgrade data center C.
For information only – Review of existing marketing strategy – Unique opportunities found. Request for information – Expense reports for sales team – Aiming to reduce costs by 10%. Taken together these simple steps will enhance the chances of your email getting opened, read, and acted on. One last thing — never be afraid to delete or amend the subject line of an email you’re replying to if it will add clarity. Your customers and potential customers get too much email as well! Marketing emails are normally deleted pretty much as soon as they arrive. To help your email avoid such a fate, consider these hints for marketing email subject lines. Speak to your customer’s self-interest — what benefits will they get directly from opening and acting on the email? Pique the recipient’s curiosity — create a sense of questioning and curiosity in the reader with your email subject line. Bare your soul and speak personally — people respond much better to email that’s come from a “real” person instead of a business. Show this in your subject line. Tell a story — use the email subject line to setup a narrative, something that your average reader will find interesting and helpful. You can find some really useful information and examples of great marketing email subject lines here. So, next time it comes to creating a great email subject line, you have no excuses! 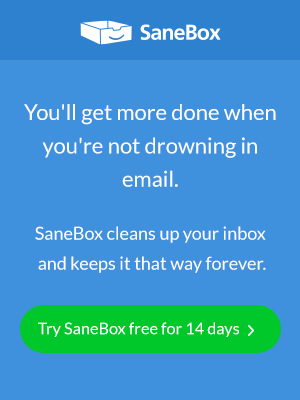 For even more email productivity power, check out what else SaneBox can do for you. Enjoy features like smart and simple email filtering, SaneLater for unimportant email, SaneNoReplies for tracking what you still need to reply to, and SaneReminders for setting follow-up reminders.